Typically I go out of my way to avoid regional jets. They’re loud, tight, require you to gate-check your bag, often don’t have first class, etc. However, there’s one regional jet I love — the Embraer 175 (perhaps more accurately, the entire family of Embraer jets, as I like the Embraer 190, etc., as well, but just don’t fly them as much). 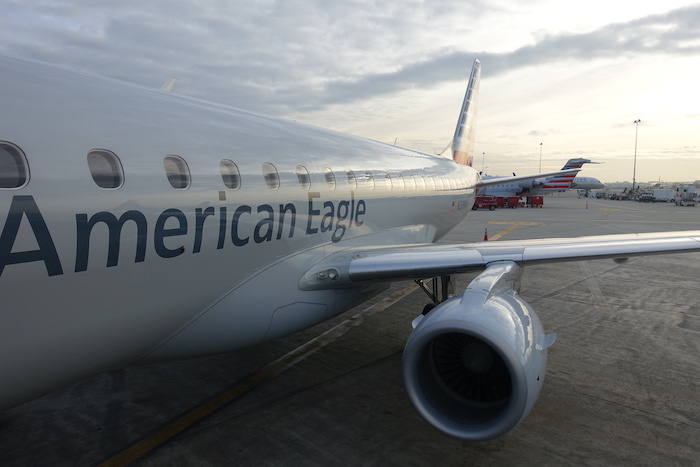 I most frequently fly the Embraer 175 on American Eagle, and I think I almost prefer the plane to American’s domestic mainline fleet. Why? There aren’t really any bad seats on the Embraer jets, as there are no middle seats. This is great if you’re traveling with someone, since you can have a window and aisle. 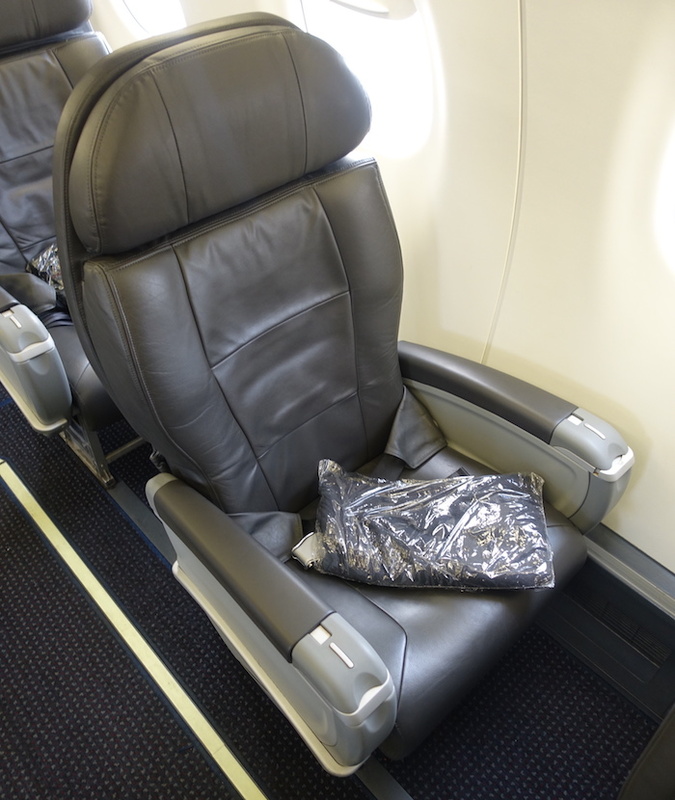 This of course varies by airline, but American’s Embraer 175s have a fantastic ratio of first class seats. 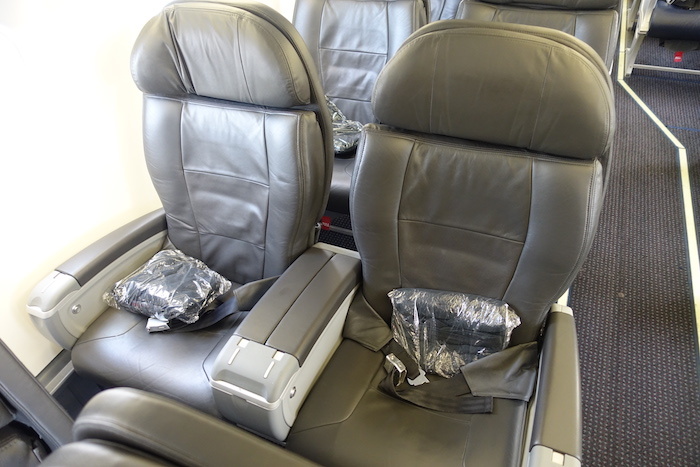 The planes have a total of 76 seats, and 12 of those are first class seats (~16% of the plane). Compare that to American’s new A321s, which have a total of 181 seats, only 16 of which are are first class seats (~9% of the plane). So upgrade chances don’t get much better than on the Embraer 175, thanks to the percentage of first class seats. Ironically, go figure that I’m writing this post from economy on an Embraer 175, after not clearing my upgrade. Grrrr! As someone who loves looking out the window but also likes having access to the aisle, this is something I really value. While economy is in a 2-2 configuration, first class is in a 1-2 configuration. So if you’re lucky, you can snag one of the solo first class seats and have both a window and an aisle. This might sound minor to some, but continuing on the above, I love looking out windows. 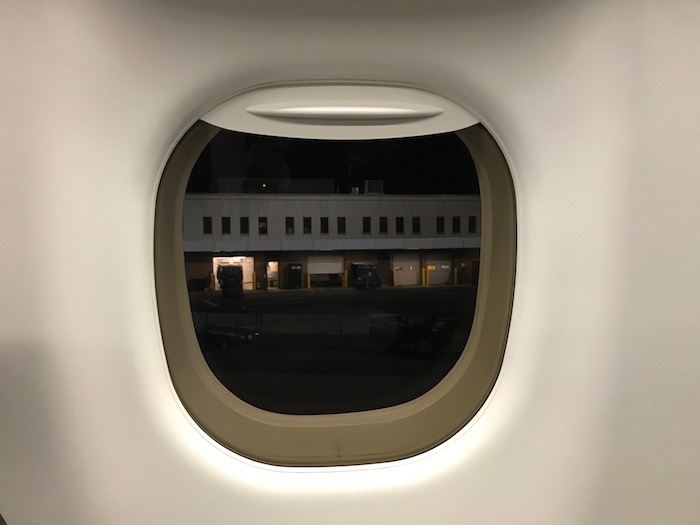 Many regional jets have small windows that aren’t even at eye-level. The Embraer 175 has huge windows (at least they feel that way) at the perfect level. I really feel like they’re bigger than on typical Airbus or Boeing narrowbodies, though perhaps that’s an illusion. In terms of the passenger experience, the Embraer feels more like a big jet than a regional jet. You don’t have to crouch when walking down the aisle, the seats and aisle are wide, the overhead bins are big enough to store full size carry-ons, the plane is fairly quiet, the engines are over the wing, etc. While the CRJ-700 is about the same size, it does very much feel like a regional jet. Anyone else love Embraer jets as much as I do? What’s The Future Of The SPG Amex? Ben, I just had a similar revelation. I flew TLV-YYZ on AC 789 and appreciated everything about it, including the large windows. When I transited through YYZ and then onto an EMB190 YYZ-BOS, I was struck by the large windows, comfortable seats, and “big plane” feel of this small regional jet. They even served a “meal” (snack) in J! I hate to see the ERJ 135/145s go. While no first class, the single left seats were always fantastic and windows were huge compared to CRJs. Ben, have you thought about starting to vlog? I’d watch religiously. Hi, and thanks for the article, and the blog! I had a question I wonder if you could answer? I’m quite claustrophobic, usually only flying widebodies and frequently premium or business just for space. Would love to break out of this and try smaller planes, I do take the occasional A320/21 in business class only, do you think first class on an Embraer 175 is comparable in space terms? Another plus is that in F, the crews of the regional airlines are often better. For example, on Republic-operated AA flights they almost always come around during boarding offering a pre-departure beverage. Can probably count on one hand the times that has happened on mainline AA over the past year for me. Agree. Living near XNA (thanks Walmart!) we are lucky to have these E175 first class seats available to us on multiple daily nonstop flights to LAX, LGA, DFW and ORD. No flight is over 3 hrs, and it always feels like more of a private jet experience in first class. The leg room in row 8 is amazing, if your upgrade doesn’t clear. it is an amazing aircraft, less noise than CRJ-900, better legroom than airbus 318/19, always happy when flying Embraer E-175/95. Agreed. Enjoyable plane, in F or Y. SOME of the E-175s have power (I think when they were first started to be delivered, they came with power, then Doug decided to not pay for power anymore). You should also point out that the coach seats are the widest in the fleet. There is no comparison to a CR-J. They are so cramped. The seats are horrible. Also, the E-175 has a lav in the front for FC. I agree, it’s a great jet. I just wish they weren’t doing 7-8 legs a day, then they might actually have a better on time rate. There’s one more important reason to like these planes: the seat width in economy is 18 to 18.5 inches, which is slightly better than the A319/320/321 family and a full inch improvement on Boeing 737. The fuselage curve adds to this advantage for a window seat. The crew is always much younger. The FAs are much cuter than the old hags in the mainline. Trump needs to put an age limit for the FAs on all domestic airlines. I think 27 sounds about right. @ Dee — It certainly feels more spacious than a CRJ-700. I’d give it a try, as the plane doesn’t feel claustrophobic to me (while some other planes do). the main problem with these RJs on AA at least is the lack of ovens, I think DL has ovens on some RJs, and they are used on longish flights that would otherwise include a proper meal. Also my biggest issue (and yes I get this is a first world problem) is the RJs often do not have limes catered which impacts my G&Ts. I’m with Alex H about flying the E175 with United. Great space, they DO have power in Business Class and the FA’s are usually good. I did fly once where our front cabin FA completely helped servicing coach and left us sitting there. There were only 5 of 12 seats taken, but we all sat dry and thirsty for nearly 1 hour as the back of the plane got their beverage service. Completely bass-ackwards IMO. The drawback on longer flights is no hot meal on UA as they aren’t equipt with ovens in the galley. But seats 1-4 A are my favorite–plus there’s a dedicated lavatory up front (not a small thing when flying a couple hours or more). Lucky – could we please moderate certain comments out better. Credit gives reason for FA’s to behave so standoffish to the rest of us that actually recognize them as human beings and professionals. we disrepect them by leaving comments like that up. And no I’m not anywhere near the airline industry, just a 150k+/yr flier who has had her mix of good, adequate, and surly FAs. Credit, how would you feel if someone publicly marginalized you professionally based on your appearance. You owe yourself a well thought out answer. What would your mother or sister or daughter think of you. Funny – I just recently went through the E-175 epiphany myself and wrote about it. I generally hate RJs, to the point that I’d rather fly to an airport where I can take a larger plane and drive 3 hours the rest of the way. I finally hopped an an MQ E-175 last month, and was thoroughly impressed. Even snagged one of those single F seats. I wouldn’t hesitate to book a flight on one in the future. The lack of seat power is a drag, though. Agreed, I do love this aircraft, but recently got caught in a proper storm from LCY-DUB and boy did we bounce around up there ! Was quite terrifying but still love the aircraft. Love the E175 but not AA’s version of it. No power outlets, no IFE, and misaligned windows all through economy. @rsb29 Credit is a troll. Please don’t feed it by complaining about it’s posts. And no, barring something totally outrageous, Lucky is not going to moderate comments simply because they are idiotic, or even moderately hurtful. While I agree with Lucky’s points, I’m no lover of the E-175. It’s a better RJ than the CRJs or smaller E’s to be sure, but it’s still an RJ and you’re reminded of this every time you hit turbulence. It’s no 737. And, my biggest discomfort with this equipment is one of safety: the aircraft has no overwing exits. The larger E-190 does, but this one managed to be exempt from the requirement. I’m not paranoid, but this makes me uncomfortable. God forbid that you’re in the middle of economy and something happens that requires a rapid evacuation – you’re a long way from an exit in the middle of that equipment. It’s not enough to keep me from flying this model, but it always gives me pause. Thanks, appreciate the reply. I’ll be sure and try one out next opportunity! I had heard good things about E175 and E190s. I had my first flight on an Air Canada E190 last summer and hated it. I found the seat to be very uncomfortable with a thick fixed headrest. The headrest pushed in to my shoulders and gave me a massive back ache after a short (<2 hour) flight. Maybe other carriers use better seat designs on this plane, but the Air Canada version was torture for me. Luckily I took an A320 on the way back and it was fine. Fly them quite frequently (usually E170) from LAX-SFO, and I have to agree that I much prefer them to the 738’s that they fly on the same route. Although a great benefit of having the 738’s on the route, is that there is plenty of “backup” space if there are any delays, etc. I for one hope the AA E175s don’t get ovens, at least not until AA catering drastically improves. The cold meals on Eagle are so much better than the dreck that passes for hot meals on AA mainline. If you’re flying to/from LAX having to deal with the bus to the remote terminal plus being lower priority for any weather problems (really just comes up on LAX/SFO) negate a lot of the positives in my opinion. The E175 is leaps and bounds better than the CRJ700/900 (which it competes with). I love this plane and have used it often to and from SAN-LAX for positioning flights on foreign carriers. It wasn’t that long ago when the only option was small, noisy prop planes with tiny bins and seats. Huge improvement. I was flying on JetBlue a few weeks ago and also had this epiphany. The plane feels a lot more spacious than it probably is, and the windows are indeed fantastic. Love flying the 175 (and the larger 190) for all the above reasons and it was my fav until I flew the LX CS100. This article hit my twitter feed as I was sitting on an Alaska E175 (Skywest) getting ready to fly to Tucson. Very nice plane for all the reasons mentioned above. My FC upgrade didnt clear, I was next on the list, so I sat in row 8. As mentioned in an above comment, crazy leg room and I’m 6’3. I was Horizon would use his plane. Agree, I really like them. 2 x 2 seating is great when traveling with someone. They also fly surprisingly high and fast, which is cool nerd factor stuff. I totally love the e190. I fly them here in Australia and unfortunately our airline is decommissioning them. Sad face. I love the ERJ-170/75/90 series, for all the reasons you mentioned. One you didn’t mention is how you get all those features but also get the benefit of fewer passengers. 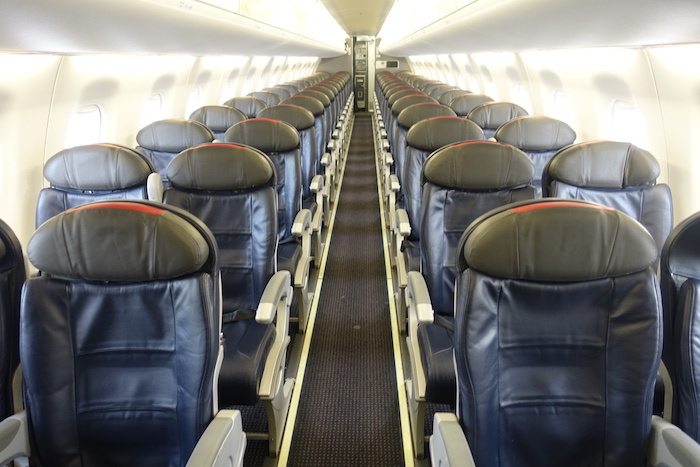 Boarding and deplaning takes less time than a 737 of course and the ERJ 175 has all the same amenities. I flew a UA EWR-PIT last week and it was great. Comfortable, quiet, and love the standard size bins. EMB makes a great product. How about overhead storage space on E175s? Can you fit a 20″ rollaboard there? Generally agree 100%. Great aircraft with the right level of comfort and space for the missions it flies. @ view — Yep, easily. In first class it goes in wheels first, while in economy it goes in sideways. My favorite regularly scheduled domestic flight is Delta’s early evening departure from Little Rock to Detroit. The sunset views from seat 1A are just spectacular! For two hours I can relax in that comfortable seat, enjoy my bloody mary, and just stare out at that explosion of color. Oops…I just remembered that this flight operates with the CRJ 900, not the Embraer 175. But, still, it’s such a lovely flight. I must come to @Credit’s defense. He really isn’t a troll. Yes, some of his humor can be inappropriate; but, he has left some very thoughtful comments and observations through the years. Agree on E145! Although it has only 50 seats, configuration 1-2 is perfect, even in economy. In Europe, i belive only Hop! for AirFrance still flies them. I don’t care about business seat in a sub 2h flight, but that possiblity of being seated alone in the economy is great. Though, it has its disadvantages. Hand luggage is limited, and usually small carry-on suitcases have to be stored downstairs, and its quite loud, especially in the back. Bit i find all embraers quite loud. And don’t even mention landing in a windy conditions. Better than any rollercoaster. I’m completely astonished and proud about all comments. I work at Embraer Engineering for almost 12 years and once flow a regional flight in USA. I was in a hurry and didn’t pay attention the a/c model and though it was a bigger plane due to extra leg room. It was a surprise when I heard safety disclosure regarding the E175. Dispite all difficults we can face, to read all this “feedback” makes everything worth. Nowadays we push E2 on motion. God gave me a blessing opportunity to see one more 1st flight with the E190-E2. It was fantastic and at least external noise were incredibly smaller compared to E1. Hope we can bring to all of you even more peaceful and pleasant flights in 2018. Anders: thanks for that video! Exceptional. Air Canada E190’s have ovens and wifi now. J bathroom hard for a 6’+ flyer to stand upright in but otherwise a good aircraft. Lucky have you done a comparison between the E175/190 and the new Bombardier CS100? A few European airlines such as Swiss are flying them now and apparently are quite popular with fliers. I have flown on E190/195’s with Montenegro Airlines, HOP! and KLM Cityhopper and on E170’s with HOP! and I agree – the aircraft is pleasantly comfortable and convenient from a passenger viewpoint. I cannot say the same about E145’s though. I flew on these with HOP! and with Luxair (which, incidentally, is just finishing phasing them out in favor of Q400’s), and each time I found the overhead space way too small (and I’m only 5’9”!! ), even smaller than on CRJ700/900/1000’s. I have never felt comfortable on an E145, even for a sub-hour flight in Europe. Also, I concur with @Matty – the back of an E145 tends to be very noisy, especially during takeoff. All Austral’s (Aerolineas Argentinas shuttle) jets are Embraer have USB outlets in here seat and a huge screen. I love to flight Austral’s Embraer jets for the same reasons plus the USB port! I know this is an older post but is there any difference with United’s ERJ-175? (Republic dba United Express) and thoughts on turbulence in these planes? Are they as safe in your opinion as the 737? Thanks for any input! @ Erica S — Should be a very similar plane, and yes, it’s absolutely safe. 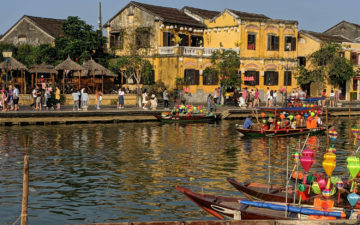 Are mainline jets safer because (correct me if I’m wrong) regional jet pilots are inexperienced beavers working at near third world wages, hoping to get a mainline job? It’s like getting medical care at a university where the doctors are really residents in training….eager but inexperienced? How does row 8’s legroom compare to First Class? Hoping a Milesaver FC will open up if not I have my row 8 seat reserved (behind the 2 seat row in FC)? Considering for a 4 hour flight from Milwaukee to Seattle & back. Will my back, neck & shoulders ache after this? Yes, I love the 175’s also…except, almost never fails, it starts to drop ice out of the vents on any trip longer than 1 hour. Not an issue on other aircraft, only seems to happen on the Embraer planes. I am going from Indianapolis to New York and this is my first time on a plane EVER,, (let me also add I will be doing this flight by myself) I’m so scared that I will feel claustrophobic . 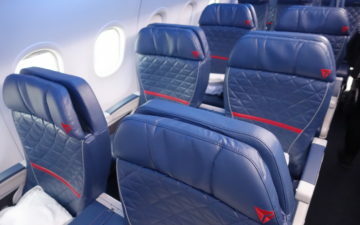 I will be taking the embraer 175 operated by Republic Airlines DBA Delta Connections, I am very claustrophobic and was wondering if this plane is small feeling on the inside? And also where is a good seat if you can’t afford first class? Question: Is it worth the extra few hundred dollars to upgrade to 1st class? I usually use points but rarely fly AA so don’t have enough points for an upgrade. It’s a 2.75 hour flight so am wondering if the extra comfort might be worth it. @ Kia — For a few hundred dollars I’d say it’s probably not worth it on such a short flight, especially since economy is quite comfortable as well. The 170/190 sound like a big improvement over the 135/145 but if 21″ bags have to be stored sideways, aren’t there often some passengers that end up without space for theirs? FYI, wikipedia says the E2 storage is larger. I wonder if they still have to go sideways. I recently flew on UA ER-175 in Y (16th row) from AUS to SFO. I found seats to be hard, but comfortable for 3.5h flight. Didn’t have slipping sensation, that I endure in 738. Leg room was more than sufficient (I’m 5’10). But the best feature was large, completely uncramped space under the seat in front of me, that allowed stretching and little exercises for lower legs. I’m 61 and cramping is problem for me. I loved it enough to not bother paying $$$ for F in this aircraft (there is always chance of status based upgrade anyway). O the 777 vs the e170 it is a HUGE difference. The e190 my 5 foot kid could almost put his feet out straight! We have a full-size service dog and want know how floor space on the Alaska from SFO to SNA on an E175. Any way to find the floor dimensions between the seat standards for regular and first class? Thanks! For many of the reasons mentioned, I always seek out smaller aircraft and the airlines that operate them, whenever I need to fly. MD 80s/Boeing 717s are good in that regard as long as you get a seat on the two-across side of the aisle. Made sure I had the same aircraft on the return as well :). Sat in one of the coveted single seats . Comfortable , but what I like about the plane is the larger jet feeling but smaller jet conveniences . 190 fabulous as well .